1. Calculate built in potential of a germanium PN junction at 300oK, if P-side is doped with 5 x 1016 acceptors/cm3 and N-side with 5 x 1014 donors/cm3. 2. The resistivites of the two sides of an abrupt silicon PN junction are 9.6 Ω-cm on P-side and 100 Ω-cm on N-side. Find contact potential at room temperature. 3. For what voltage, will the reverse current in a PN junction silicon diode reach 95% of its saturation value at room temperature? 4. What is the ratio of currents for a forward bias of 0.1 volt to the current for the same magnitude of reverse bias of silicon PN junction at room temperature? 5. If the reverse saturation current in a silicon PN junction is 1 nA. Find the applied voltage for a forward current of 0.5 µA? 6. A silicon diode at room temperature conducts 5 mA at 0.7 volts. If the voltage increases to 0.8 volts, find the diode current. 7. What is the change in voltage at 300oK for a tenfold increase in current for a silicon diode operating in the conducting region? 8. 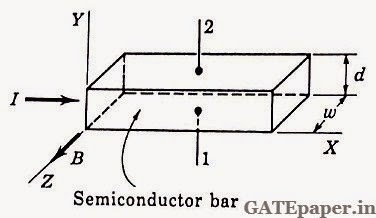 For a silicon diode operating under conducting region at room temperature, if the voltage is increased by 0.24 volts, then the current flowing through it increases by _______ number of times. 9. Calculate the factor by which the reverse saturation current of a germanium diode is multiplied, when the temperature is increased from 20 to 100oC. 10. What increase in temperature would result in a reverse saturation current, which is 50 times its value at room temperature? 11. A silicon diode operates at a forward voltage of 0.7 volts. 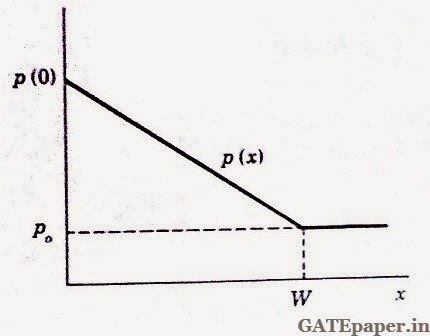 Calculate the factor by which the current will be multiplied, when the temperature is decreased from 25oC to – 55oC. 12. For a silicon P+N junction, ND = 1015 atoms/cm3 and the built in potential of 0.5 volts. 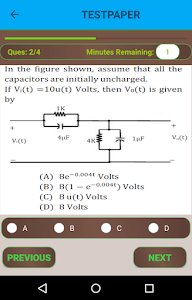 If the applied reverse voltage is 10 volts, find the value of electric field at the junction. 13. Calculate the width of depletion region of a PN junction under open circuit, when doped equally on both sides with 1021 atoms/m3. Assume built in potential of 0.2 volts and εr = 10. 14. Find the magnitude of the electric field at the center of depletion region of silicon PN junction with NA = ND = 1021 atoms per m3 and built in potential of 0.6 volts. 16. The zero voltage barrier height of an alloy silicon PN+ junction is 0.6 volts, given NA = 5 x 1016 atoms/cm3. Calculate the width of depletion layer for an applied reverse voltage of 5.6 volts. 17. The zero voltage barrier height of an alloy silicon P+N junction is 0.6 volts, given ND = 5 x 1016 per cm3. Calculate the width of depletion layer for an applied forward voltage of 0.5 volts. 18. A silicon PN junction is formed from P material doped with 1022 acceptors/m3 and N material doped with 1.2 x 1021 donors/m3. Find the thermal voltage and barrier voltage at 27oC. 19. A silicon diode has a saturation current of 0.1 pA at 20oC. Find its current when it is forward biased by 0.55 volts. Find the current in the same diode when the temperature rises to 100oC. 20. A silicon PN junction is formed from N material doped with 2.5 x 1021 donors/m3 and P material doped to have the same impurity density. Assume ni = 1.5 x 1016 /m3 and is temperature independent. a. Find thermal voltage and barrier voltage at 40oC. b. To what temperature would the junction have to be raised (in oC) in order that the thermal voltage be 30 mV? What would be the barrier voltage at that temperature? 21. A silicon PN junction has a saturation current of 1.8 x 10-14 A. Assuming that η=1 and the temperature is 27oC. a. Find the current in the junction when the forward biasing voltage is 0.6 volts . b. Repeat (a) when forward biasing voltage is 0.65 volts. 22. The forward current in a PN junction is 1.5 mA at 27oC. If Io = 2.4 x 10-14 A and η = 1. What is the forward biasing voltage across the junction? 23. The forward current in a PN junction is 22 mA, when the forward biasing voltage is 0.64 volts. If the thermal voltage is 26 mV and η = 1, find the reverse saturation current? 24. A bar of silicon is doped so that one side (side A) has 1.85 x 1022 electrons/m3 and the other side (side B) has 2.66 x 1010 electrons/m3. If the bar is to be used as a junction diode, which side should be the anode and which side is cathode? 25. The reverse breakdown voltage of a certain diode is 150 volts and its reverse saturation current is 0.1 pA. What is the current in the diode, when the reverse bias voltage is 149.95 volts? Assume constant n = 2. 26. For a certain diode, a reverse current of 9.3 nA was measured when the reverse voltage across the diode was 349.99 volts. If the breakdown voltage is 350 volts and reverse saturation current is 0.1 pA, find the value of the constant ‘n’? 27. A diode has its maximum power dissipation rating as 0.1 watts and its reverse breakdown voltage as 200 volts. What maximum reverse current does it sustain at breakdown without damage? 28. A diode has a reverse breakdown voltage of 100 volts and a saturation current of 0.05 pA. How much power does it dissipate when the reverse voltage is 99.99 volts? Assume constant n = 2.5. 29. A diode has a reverse saturation current of 45 pA at a temperature of 373oK. What is the approximate value of Io at 273oK? 30. When the voltage across a forward biased diode at T = 10oC is 0.621 volts and the current is 4.3 mA. If the current is held constant, what is the voltage at T = 40oC and T= - 30oC. 1. Find the magnitude of the Hall voltage VH in an N-type silicon bar used in given figure, which has a majority carrier concentration ND = 1013/cm3. Assume Bz = 0.2 Wb/m2, d = 5 mm and εx = 5 V/cm. 2. Find the magnitude of the Hall voltage VH in an P-type silicon bar used in given figure, which has a majority carrier concentration NA = 1012/cm3. Assume Bz = 0.2 Wb/m2, d = 5 mm and εx = 5 V/cm. 3. The Hall effect is used to determine the mobility of holes in a P-type silicon bar used in figure shown. Assume the bar resistivity is 2,00,000 Ω-cm, the magnetic field Bz = 0.1 Wb/m2, and d = w = 2 mm. The measured values of the current and Hall voltage are 5 µA and 30 mV. Find mobility of holes. 4. An N-type silicon bar whose resistivity is 1000 Ω-m is used in the figure shown, with w = 1 cm. If the current is 10 µA and the Hall voltage is 40 mV, what is the intensity Bz of the applied magnetic field? 5. The hole concentration in a semiconductor specimen is shown below. a. Find an expression for and sketch the hole current density Jp(x) for the case in which there is no externally applied electric field. b. Find an expression for and sketch the built in electric field that must exist, if there is to be no net hole current associated with the distribution shown. c. Find the value of the potential between the points x = 0 and x = W, if P(0)/ Po = 103. 6. Let the Hall effect could not be observed in a germanium sample, whose conduction electron mobility is 2.1 times that of holes. Find the ratio of conduction electron and hole concentrations. 7. A germanium sample is oriented normal to 0.5 Tesla magnetic field, when a current of 1 mA is passed through it by applying a potential difference of 400 mV. Calculate Hall voltage, if concentration of majority carriers = 5.2 x 1019/m3, L = 2 cm and w = d = 1 cm. 8. In the Hall effect experiment, a P-type semiconductor bar of width 1 cm and length of 5 cm is placed in the magnetic field of 0.5 Tesla. A potential difference of 10 volts is applied across the edges. Given VH = 0.05 volts, σ = 2.5 x 10-2 Ω-cm. a. Determine Hall coefficient, RH. b. Concentration of holes, NA. 9. A P-type silicon semiconductor bar with resistivity 3,00,000 Ω-cm is placed in a transverse magnetic field of 0.1 Wb/m2 and d = w = 6 mm. If the measured values of current flowing through and Hall voltage are 10 µA and 60 mV respectively, find mobility of holes. 10. A sample of silicon is doped with 1017 phosphorous atoms/cm3. Find the Hall voltage, if the sample has 100 µm thick, Ix = 1 mA and Bz = 10-5 Wb/m2? 1. A bar of silicon with intrinsic electron density 1.4 x 1016 electronics/m3 is doped with impurity atoms until the hole density is 8.5 x 1021 holes/m3. The motilities of the electronics and holes are µn = 0.14 m2/V-sec and µp = 0.05 m2/V-sec. a. Find the electron density of the extrinsic material. b. Is the extrinsic material N-type or P-type? c. Find the extrinsic conductivity. 2. How many free electrons are in one cubic inch of N-type silicon, if the intrinsic electron density is 1.5 x 1016 electrons/m3 and the extrinsic hole density is 0.82 x 1011 holes/m3? (one inch = 2.54 cm). Assume that all donor atoms are ionized. 3. How many free electrons are in a bar of extrinsic germanium measuring (4 mm) x (50 mm) x (1.5 mm) if the intrinsic hole density is 2.4 x 1019 holes/m3 and the extrinsic hole density is 7.85 x 1014 holes/m3? Assume that all donor atoms are ionized. 4. One cubic centimetre of silicon has been doped with 1.8 x 1014 atoms of arsenic. What are the electron and hole densities in the doped material? Assume that all impurity atoms are ionized. 5. Find the current density in extrinsic semiconductor at room temperature, whose hole density is 4.5 x 1018 holes/m3, when an 8 kV/m electric field intensity is established in it? 6. Find the total current in the extrinsic silicon bar shown below at room temperature, if the electron density in the bar is 2.6 x 1020 electrons/m3. 7. A bar of P-type silicon at room temperature has a majority carrier density of 7.62 x 1022 carriers/m3. Its cross sectional area is 2.4 x 10-6 m2. How long should the bar be in order to have a resistance between its ends of 8.2Ω? 8. A bar of silicon 0.1 cm long has a cross sectional are of 8 x 10-8 m2 and is heavily doped with phosphorous. What should be the majority carrier density if the bar is to have a resistance of 1.5 kΩ? Assume room temperature. 9. If donor impurity is added to the extent of 1 impurity atom in 107 germanium atoms, then find the conductivity of doped semiconductor. 10. Find the ratio of conductivity of N-type silicon doped with 1 in 108 silicon atoms to that of intrinsic silicon at room temperature. 11. Find the conductivity of germanium, when doped simultaneously with 1 donor in 106 Ge atoms and 1 acceptor atom in 107 Ge atoms. 12. Calculate the electron and hole concentrations of extrinsic silicon sample, when the conductivity is minimum. Assume µn = 1350 cm2/V-sec and µp = 450 cm2/V-sec. 13. 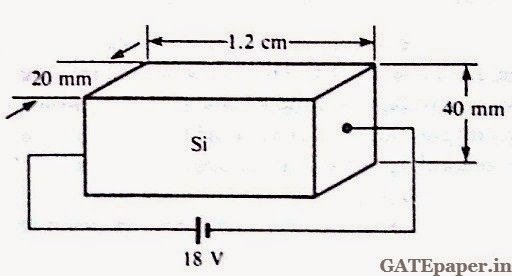 If the resistivity of P-type silicon bar is 0.12 Ω-cm, then find electron and hole concentrations per cm3. 14. A 1kΩ resistor is to be fabricated using a P-type silicon bar with 4 mm thick, 20 µm wide and 400 µm long. Find the required acceptor concentration per m3. 15. Find the change in resistivity of N-type germanium with 1 donor per 109 germanium atoms to that of intrinsic germanium. 16. A sample of germanium is doped to the extent of 2 x 1014 donors/cm3 and 1.5 x 1014 acceptors/cm3. At a temperature of sample, the resistivity of pure germanium is 80 Ω-cm. Find the total current density if the applied electric field is 5 V/cm. 17. A block of silicon is doped with a donor atom density of 3 x 1014 per cm3 and acceptor atom density of 0.5 x 1014 per cm3. Determine the resultant densities of free electrons and holes per cm3. 18. Determine the concentration of free electrons and holes in a sample of Ge at 300oK, which has a concentration of 2 x 1014 donors/cm3 and 3 x 1014 acceptors/cm3. 19. A sample of germanium is doped with 1014 donors/cm3 and 7 x 1013 acceptors per cm3. At temperature of the sample, the resistivity of pure germanium is 60 Ω-cm. Assume mobility of electron is equal to mobility of hole. Find the applied electric field if the total current density is 52.3 mA/cm2. 20. A cylindrically shaped section of N-type silicon has 1 mm length and 0.1 mm2 cross sectional area. Find the ratio of resistance of pure germanium to that of germanium doped with 8 x 1013 donors/cm3. 21. In an N-type germanium, the resistivity is measured to be 10-3 Ω-m, for an impurity concentration of 1022 donors/m3. Find the values of mobility and relaxation time of electron. 22. Calculate the position of Fermi level relative to intrinsic Fermi level in silicon at 300oK, if the doping concentration is 1016 donors/cm3. 23. A silicon sample is doped with 1017 arsenic atoms/cm3. a. Find equilibrium hole concentration Po at 300oK. b. Find the relative position of Fermi level with respect to intrinsic Fermi level. 24. A silicon sample is doped with 6 x 1015 donors/cm3 and 2 x 1015 acceptors/cm3. Find the position of Fermi level with respect to intrinsic Fermi level at 300oK. 25. In an N-type semiconductor, if the Fermi level lies 0.6 eV below conduction band at 300oK. Find the new position of Fermi level at 330oK. 26. In an N-type semiconductor, Fermi level lies 0.02 eV below conduction band edge. If the donor concentration is increased by 4 times, find the new position of Fermi level. 27. A germanium sample is doped with 1 phosphorous atom per 108 germanium atoms. Assume effective mass of electron is half of its true mass. At what doping level (ND), Fermi level coincides with conduction band edge. 28. A silicon sample is doped with 1 donor atom per 2 x 108 silicon atoms. Assume effective mass of electron is same as its true mass. Find the temperature, at which Fermi level coincides with conduction band edge. 29. How much donor impurity should be added to pure germanium, so that its resistivity drops to 10% of its original value? 30. Find the concentration of holes and electrons in P-type germanium at room temperature, if the resistivity is 0.02 Ω-cm. 31. Find the resistivity if a donor type impurity is added to the extent of 1 atom per 108 germanium atoms. 32. A donor type impurity is added and the resistivity decreases to 9.6 Ω-cm. Compute the ratio of donor atoms to silicon atoms per unit volume. 33. Determine the concentration of free electrons and holes in a sample of silicon at 500oK, which has a concentration of donors equal to ND = 1.874 x 1013 atoms/cm3 and of acceptor atoms equal to NA = 3.748 x 1013 atoms/cm3. Show that the sample is essentially intrinsic. Explain why.